Chris Matthews gave guest Harry Reid (D-Nevada) a softball interview tonight wherein the Senate Minority :eader blamed Republicans on a lack of comity in the world's greatest deliberative body and insisted Democrats had always opposed extreme delay-and-deny tactics for presidential judicial nominations. Although this is patently false, Matthews didn't challege his assertions. Supreme Court 'Tilts Further to the Right'...After Tacking Firmly to the Left For Obama? Readers are advised to remove all food, fluids, and flammables from proximity to their computers before proceeding. You've been warned. Variety magazine just released its 2011 "Women's Impact Report" – examining the influence of women in media – which included NBC "Today" co-host Ann Curry, who was described as "'Today's' voice of intelligence, compassion." This is the same Ann Curry that could not find Illinois on a map. The same Ann Curry that wished all weapons could be inflatable toys. The same Ann Curry that proclaimed that a blender powered by a bicycle could actually "save the environment!" Read the Media Research Center's full Profile in Bias of Curry. Times Watch's new study "Supremely Slanted -- How the New York Times Pounds Conservatives and Coddles Liberals When Nominated for the Supreme Court," was discussed by Fox News contributor Liz Trotta on "America's News Headquarters" just before the one o'clock hour on Saturday afternoon. Fox News Host Uma Pemmaraju: "But there's another poll, out right now that looks at media behavior as well and specifically how the media handles the Supreme Court nominees, how are those related?" As liberal Justice Elena Kagan takes her place on the Supreme Court next week, she could thank The New York Times for making her confirmation process smoother. Ever since Ronald Reagan nominated Robert Bork and he was rejected by the Senate in 1987 for his views and not his character or qualifications, confirmation battles for liberals have become less like judicial seminars and more like political campaigns. For almost 20 years, in this new era of activist groups and activist reporters, The New York Times has covered Supreme Court fights with a heavy finger on the scales of justice, tipping the balance. They have painted conservatives as highly controversial and dangerously ideological, while liberal nominees were presented as "brilliant" moderates who were only newsworthy in that they were often laudably "historic" choices, or, in Kagan's case, she was not only "brilliant," but "very funny, warm and witty." For Supremely Slanted, Times Watch analyzed the arc of coverage over the last two decades and the last seven Supreme Court justices, from Clarence Thomas's nomination in 1991 to Elena Kagan's confirmation in 2010, and found stark differences in how the Times reported on the four Justices nominated by Democrats versus the three nominated by Republicans. The Times demonstrated a 10-1 disparity in labeling "conservative" justices nominated by Republicans compared to "liberal" ones nominated by Democrats. In all, the three Republican-nominated justices were labeled "conservative" 105 times, while the four justices nominated by Democrats were labeled liberal on just 14 occasions. The news equally excited the TV network journalists. “History was made in this country today when the Senate confirmed Elena Kagan to the U.S. Supreme Court,” declared fill-in NBC Nightly News anchor Lester Holt as viewers were treated to a “Making History” on-screen graphic. We are here in Washington on the day a new voice joins the Supreme Court. 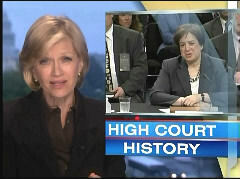 Elena Kagan, the third woman currently on the court, a woman with a reputation for holding her own in any room. And our Jonathan Karl is right here to tell us about the big vote right over there on Capitol Hill. And I want to know what happens when a new justice dons the robe for the first time, Jon? During ABC's live special coverage of Roberts's nomination on July 19, 2005, then This Week host and former Democratic operative George Stephanopoulos declared: "This is a very conservative man with a strong paper trail that proves it." NPR's Nina Totenberg could hardly contain her urge to label, using the word "conservative" several times during a July 23 appearance on Inside Washington: "John Roberts is a really conservative guy...he's a conservative Catholic....[President Bush] has given conservatives a hardline conservative." The same labeling followed Alito's nomination months later. CBS's Bob Schieffer opened the October 31 Evening News by proclaiming: “Conservatives wanted a conservative on the Supreme Court, and said the President ought to risk a fight in the Senate to get one. Their wishes have been fulfilled.” Later that evening, on a special 7PM ET hour edition of CNN's The Situation Room, anchor Wolf Blitzer described: "...there is a new nomination and new controversy. A battle shapes up as the president picks a staunch conservative who could help reshape the U.S. Supreme Court." “The people on Twitter who are whining about us covering a very important part of this story are whiners and beyond that they’re just stupid,” fumed Scarborough. They need to shut up, okay. If you’re too stupid to follow this, just turn to SpongeBob, okay, and watch it with your kids, and drool out the left side of your mouth because you’re too dumb. You don’t understand politics and you’re going to hurt yourself watching this show.